Now, isn't that an exciting idea? No shot would be too high for the fielders as they jump up against a gravitational force that's about 16 percent of earth's. Imagine what all Jonty could have done there! 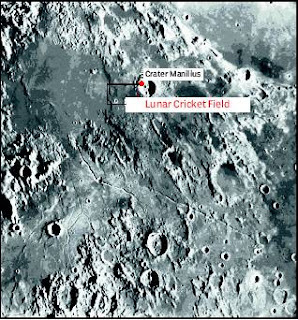 An internet cricket gaming company has just acquired land to build a cricket field on the moon - and that for a mindboggling sum of 25 $ . ( I am already thinking of renting it out for myself for a year or so !!) . Wonder what the valuation of the entire moon is - am quite surprised why Richard Branson hasn't yet bought it out completely? Surely, if that's the price of a cricket field on the moon, the entire moon can't be too expensive for Mr. Virgin. I hope you aren't getting any ideas for yourself.